same reefs in 1970 !! 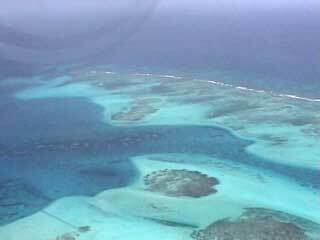 Since long modern reefs were studied by geoscientists to gain models for ancient reefs, carbonate sedimentation and oil and gas exploration. Only more recently, the importance and value of modern reefs for mankind has been understood better: reefs protect coasts, provide food, are a huge pharmaceutical reserve, interact with the climate and have an enormous touristic value. Sadly, the condition of modern reefs is very poor. We provide all from 1-minute clips to nearly one-hour full length videos on modern reefs to improve knowledge on this marvelous ecological systems and to help setting up educational programs. Many thanks to the companies and TV-stations who produced videos with us and for us, for permission to show part of their videos here. Page 'Modern Coral Reefs I' presents movies fully produced by Palaeontology Munich and GeoBio-Center at LMU, or directly cooperating scientists. Page 'Modern Coral Reefs II' presents third party movies, many of which were produced on the occasion of the International Year of the Reef (1997) which for Germany was organized by the Stuttgart-Munich-Reef Group (Note that most members of the Stuttgart reef group 1997 are now working at Munich). Have fun and enjoy our videos on modern reefs! We did exhaustive educational filming on this splendid excursion. 8 min. video, with english subtitle explanations and background sound. 25 minute streaming and fast start versions are also available, with extended aerial and underwater views. 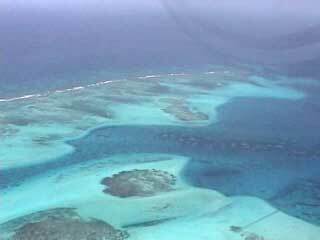 Click image up for clip on the fossil (Pleistocene and miocene) reefs of San Andres. opens as 1,5 size-movie in QT-Player, you may resize it to normal for higher focus. .mov, 1 MB, 0:21 min). (Web compression for this old movie filmed on Super 8 tape is difficult (owing to high video background noise). This is why we need DSL as a minimum bandwith (768-DSL). This movie shot by PD Dr. Jörn Geister, Univ. Bern, in the year 1970 is a unique, historic document of the healthy state of the reefs at those days. 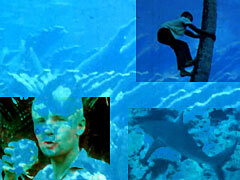 We suggest you compare with the above movie from our Reef Excursion 2002. Both movies include many identical places. The lack of reef fishes and deterioration of reef corals is obvious to anyone. The fast start version comes along with detailed maps and explanations. Movie starts with a 3-min clip of the beautiful island of San Andres and its friendly people (including a shot of Jörn Geister who did fieldwork for his PhD-thesis there). The rest of the 10:23-minute represents underwater filming by Jörn Geister and Sid Anderson). A working group of Palaeontology Munich (headed by Reinhold Leinfelder) is currently performing geobiological and geological studies in this pristine area. We will soon present video clips from the research field trip 2001.